Rev. John Banister Tabb (March 22, 1845 – November 19, 1909) was a Catholic priest and professor of English. Born into one of Virginia’s oldest and wealthiest families, at “The Forest” in Amelia County, Tabb fell in love in his teens, though his marriage proposal to the neighbor girl was declined. He became a blockade runner for the Confederacy during the Civil War. After being captured, he spent seven harrowing months in a Union prison camp — the infamous “Bullpen” at Point Lookout, Maryland, in which he turned 19 years old. Continuously surrounded by men seriously ill, who were dying at the rate of 10 to 20 a day, he formed there a life-long friendship with fellow-poet and musician Sidney Lanier. Tabb had been an Episcopalian, and was even a candidate for orders in the Episcopal Diocese of Maryland. He joined the Catholic Church, September 8, 1872 — the feast day of the birth of the Blessed Virgin Mary — following the lead of his pastor and mentor, Rev. Alfred Curtis. (The Episcopalian minister had been received into the Church earlier that year by Bl. John Henry Newman, and would eventually become the second bishop of Wilmington, Delaware. In 1882, Tabb dedicated his first book, privately printed and called Poems, to Cardinal Newman.) Tabb would remain the sole Catholic in his family. He began to teach English and Greek at Saint Charles’ College, Ellicott City, Maryland, in 1878. He was ordained to the priesthood, December 20, 1884, by Rt. Rev. James (later Cardinal) Gibbons, who had received him into the Catholic Church 12 years earlier. Tabb retained his academic position at St. Charles, which was staffed by members of the Society of St. Sulpice; he himself, however, never joined the Sulpicians, remaining a secular priest of the Diocese of Richmond. Though plagued by eye problems and chronic insomnia, he was a gifted pianist, talented sketch artist, and popular teacher. He lost his eyesight completely about a year before he died in the college rooms he had continued to occupy after his retirement in 1907. He is buried in the Hollywood Cemetery in Richmond. 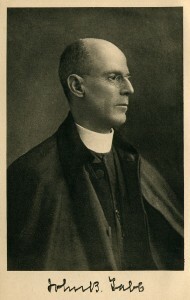 Father Tabb, as he was commonly known, was widely published in popular and prestigious magazines of the day — after a dozen or so years marked largely by rejection. His biographer and editor, Francis A. Litz, uncovered 279 such poems all told. The first was published in Harper’s Monthly, July 1877; the last, in The Cosmopolitan, posthumously, February 1910. His venues included The Atlantic Monthly, The Bookman, The Century, Harper’s Weekly, Lippincott’s, and Scribner’s. His original books of poetry — popular on both sides of the Atlantic in their day — include Poems (1894), Lyrics (1897), Child Verse (1899), Later Lyrics (1902), and, posthumously, Later Poems (1910). English poet and Catholic convert Alice Meynell, who prepared the author’s last volume for publication, also made A Selection from the Verses of John B. Tabb (1st ed. 1906; 2nd ed. 1910). Litz brought out the collected edition, The Poetry of Father Tabb, in 1928, and a selection, The Best Poems of John Banister Tabb, in 1957. By Litz’s count, 786 of Father Tabb’s poems had been published in his original books. Litz also discovered fifty-odd poems published in magazines that had never appeared in any of Tabb’s books. Litz also brought to light several manuscript collections, many of whose poems had never been published at all. Altogether, Lizt identified 1,064 poems that can be ascribed with certainty to John B. Tabb. It is for abundance that we must praise him — the several, separate, distinct, discrete abundance of entire brief lyrics. Would a slower or longer-witted poet have made of each of these thoughts, these fancies, these images, a longer poem? I cannot tell, but I think the longer-witted one would not have had these thoughts. 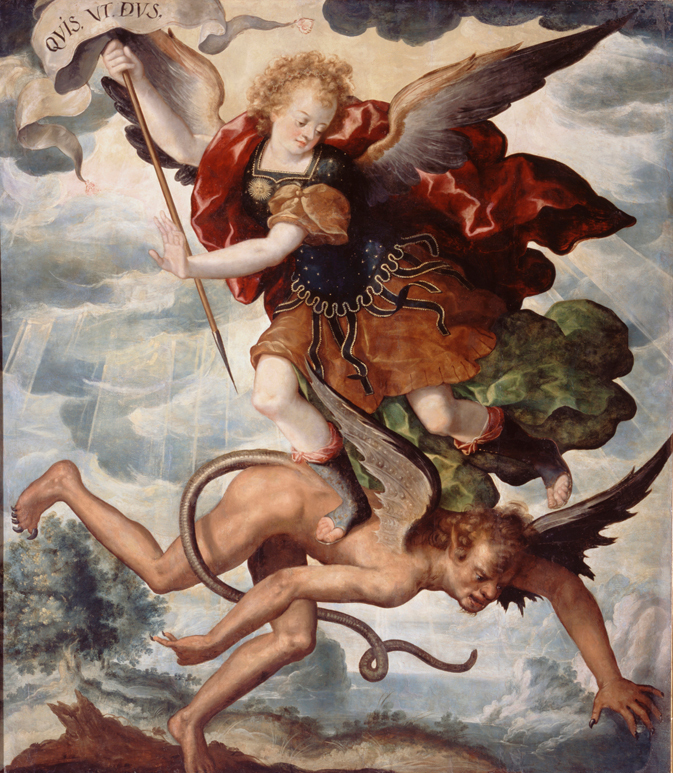 Father Tabb conceives them at once in their perfection; and one cannot think of them otherwise than as bearing their own true shape in his exquisitely shaped stanza. 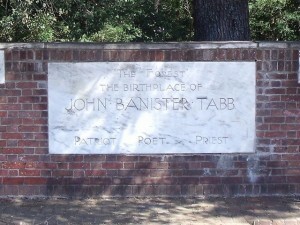 Father Tabb, a priest and teacher in St. Charles College, Maryland, was, in poetry, a carver of cameos. His work is almost wholly in very brief lyrics wrought with infinite pains. He is the lapidary of verse and his gemlike work is cold and shining. 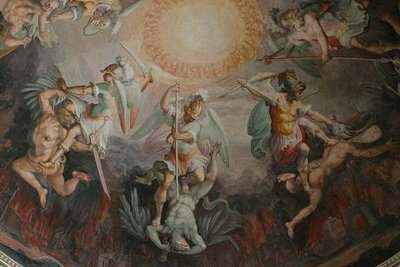 In 2013, Catholic Lane will publish an extensive selection of the poetry of John B. Tabb, on most Wednesdays of the year. The poems will be presented a handful at a time, chosen to effect a harmony of subject, theme, mood, or viewpoint — a collection of century-old gems from the quarry, brought out and set anew for a new century. “Son, give me your heart” is His word to each one of us; and when in His goodness He lets us love each other, it is giving us a share of what He asks for Himself.